Whatever medium you paint with, light is the all-important key. You can bathe your composition entirely in strong sunlight if you wish, but by restricting the brightest parts to one or two localised areas you will achieve more impact. Although I finished my book on the Scandinavian Arctic a while ago, I’ve been trying to catch up on so many things, so there’s been little time for blogging, especially with such a tremendous autumn that has tempted me out time after time. David Bellamy’s Arctic Light will be published in May 2017 by Search Press. With winter with us once more try to get out to sketch those lovely winter trees whenever you can. Choose your days, wrap up well and if you have all your sketching gear ready to hand you can work quickly before you get too cold. I usually take a thermal travel mug with me as the drink will stay warm for ages, and is a great boost to morale when the sun disappears behind a cloud. 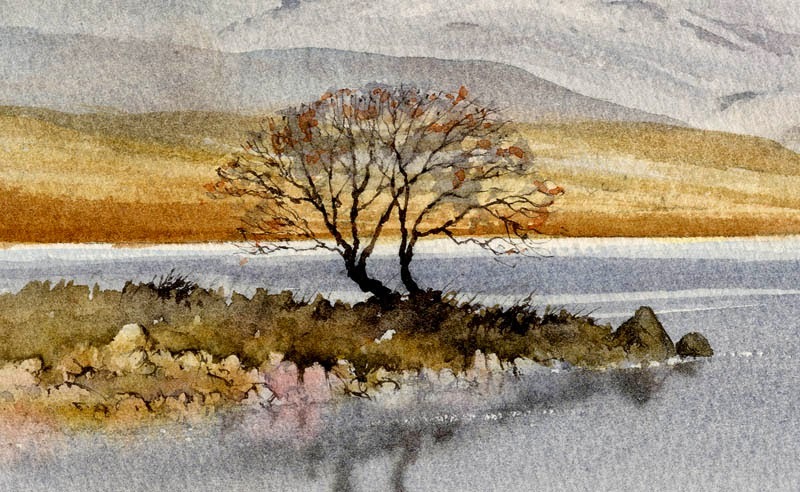 My book Winter Landscapes in Watercolour is packed with tips on painting winter scenes, working outdoors in cool weather, and making the most of those warm colours, low lighting and evocative winter trees. You can find a copy on my website together with the film of the same name, which has some stunning winter scenery and was produced by APV Films. Waterfalls are popular subjects in a painting, and I’ve had a great many exciting moments sketching them, climbing them and abseiling down them, including ones underground where they really give you that “Hey-ho, here we go, but what’s at the bottom?” sort of feeling. Having the Brecon Beacons close by is an added bonus as there are more waterfalls per square inch there than anywhere else in the country. It is fairly easy to find waterfalls as they are usually marked on walkers’ maps, and if they have a name then you can Google them to get access information and a pretty good idea of what you can expect as descriptions are often accompanied by photographs. 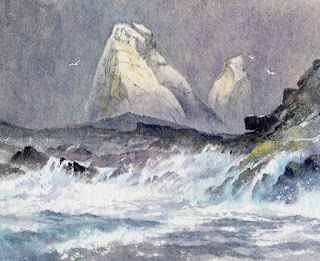 In this watercolour I used the excellent Saunders Waterford 300lb rough paper and increased the roughness even further in places where more rock textures were to appear by glueing thin Oriental papers in place. My aim was to create a sense of mystery in the background using the wet-into-wet technique to blend the furthest rock and tree shapes into the misty background, then when this was dry painting harder shapes to suggest distance. 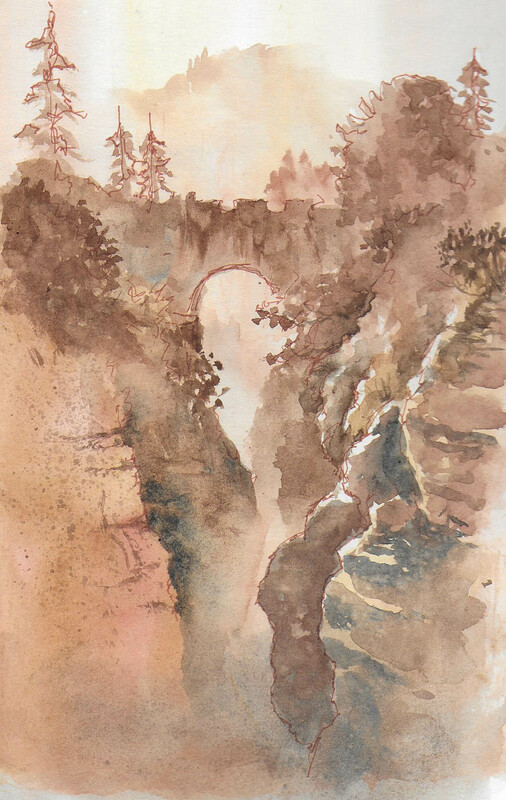 The upper falls emerges from out of this atmospheric backdrop and for the falling water I leave the paper untouched so that it stands out in strong contrast to the darker sides, and especially the hard-edged rocks jutting out. 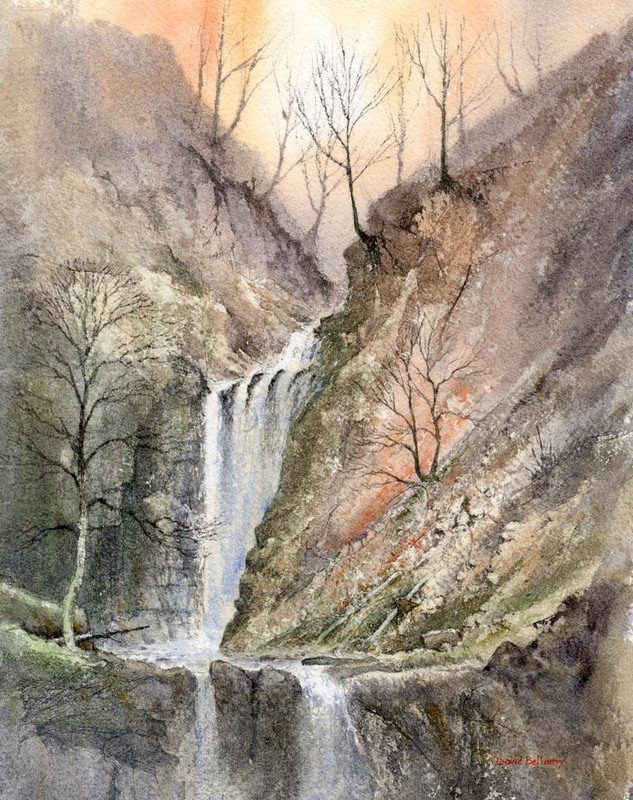 I shall be demonstrating waterfalls in watercolour at the Sandpiper Studio at Ledsham on the Wirral at the end of the month. As the first demonstration was so popular and filled up quickly, we have added another on Friday 28th October from 2pm to 4.30pm, and there are still a few places left on this one. Further details and bookings can be obtained from Julie McLean on 07788 412480 or Email her on iinfo@thesandpiperstudio.co.uk The two demonstrations will be of different waterfalls, and if you have lots of questions then bring them along! 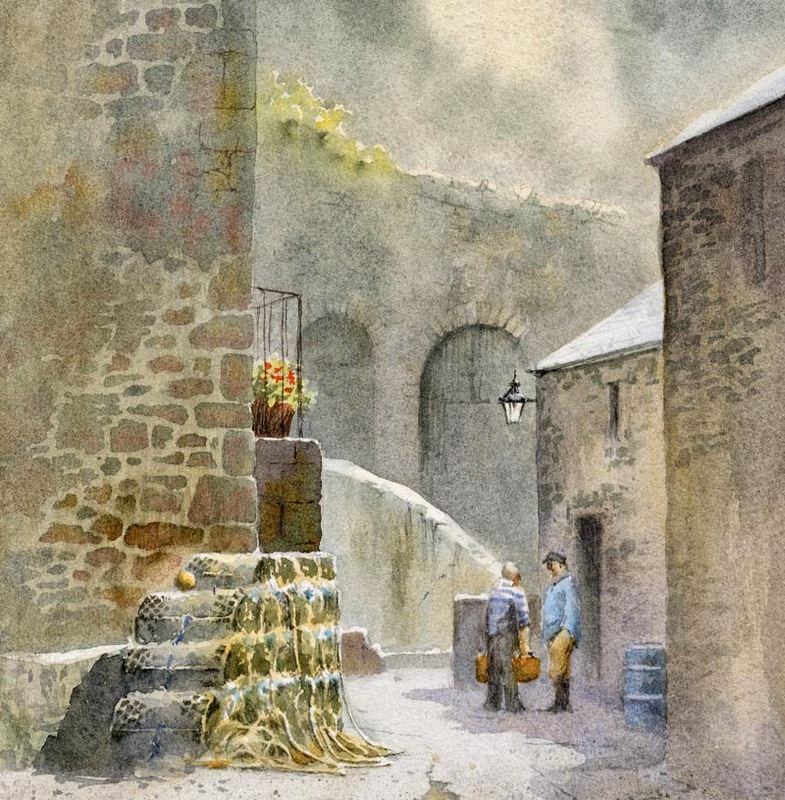 I will also be using the Daniel Smith watercolour range with their exciting colours. No abseiling is involved.